To end malaria scourge in the country, pharmacists have urged government to adopt more of team approach by involving importers and manufacturers as well as reducing foreign exchange (forex) on drug matters to enable the common man access quality health care, especially the anti-malaria ones. Speaking for the pharmacists was Pharm. Ahmed Yakasai, the President Pharmaceutical Society of Nigeria (PSN), who stressed that the Federal Government, importers and manufacturers should join hands in the strategies to control and eliminate malaria in Nigeria. Yakasai who made the call during a press conference at Pharmacy House, Lagos to mark this year’s World Malaria Day, insisted that the government should make the business environment more conducive and friendly for Pharma businesses for production of affordable anti-malaria medicines. Specifically, the PSN boss demanded for the institution of a reasonable tax regime, availability and affordability of capital and reduced exchange rate for malaria drugs. Noting that the theme of this year’s World Malaria Day is, “Ready to beat Malaria,” the PSN president underscored the collective energy and commitment of the global malaria community to unite with the common goal of ensuring a world free of malaria. On the worldwide scourge of malaria, Yakasai said that in 2016, nearly half of the world’s population was at risk of the disease, noting that most of the malaria cases and deaths occurred in sub-Saharan Africa. “The African region continues to carry a disproportionately high share of the global malaria burden. In 2016, the region was home to 90 per cent of malaria cases and 91 per cent of malaria deaths. “Some 15 countries including Nigeria – all in sub-Saharan Africa, except India – accounted for 80 per cent of the global malaria burden. “In areas with high transmission of malaria, children under five are particularly susceptible to infection, illness and death; more than two thirds (70 per cent) of all malaria deaths occur in this age group. The number of under-five malaria deaths has declined from 440 000 in 2010 to 285 000 in 2016. However, malaria remains a major killer of children under five years old, taking the life of a child every two minutes,” he stated. Yakasai saying that he was saddened that malaria still kills thousands of Nigerians, urged the government to encourage Research and Development (R & D) and take-off of petrochemical industries to encourage local production of drugs. “As long as the 95 per cent of raw materials – Active Pharmaceutical Ingredients (API) and packaging materials for drugs are imported, the prices of medicines would continue to skyrocket,” he contended. He also urged importers and manufacturers to realise that provision of anti-malarials should be seen as a social service which does not require high percentage mark up, hence the need for downward review of prices of anti-malaria. As this year’s World Malaria Day coincided with activities to commemorate the 70th anniversary of World Health Organisation (WHO), Yakasai said the PSN celebrates the achievement of WHO in the past 70 years and the progress they have made so far in improving the quality of people’s lives. The seasoned pharmacist pledged that PSN would continue to work with the world health body and other partners for the wellbeing of all Nigerians. On the state of the nation, Yakasai noted that issue of drug abuse and misuse calls for a national emergency that requires total commitment from the government and all stakeholders in the country. He however gave the National Assembly a pat on the back for giving the right attention to the menace. He added that National Agency for Food and Drug Administration and Control (NAFDAC) and PSN-YPG are collaborating to educate young people in secondary schools on the danger of drug abuse. “As the father of PSN-YPG and a friend of NAFDAC, we will continue to support this laudable initiative to make sure that all our teenagers are empowered and educated to do the right things and become contented citizens of our dear country,” he said. PSN-YPG means the Pharmaceutical Society of Nigeria – Young Pharmacists Group. Meanwhile, the PSN president again draws the attention of the federal government to the spate of unwholesome strikes by health workers in Nigeria with the consequent fallout of avoidable morbidity and mortality. He contended that at the root of the avoidable strikes was the desire for benefit packages and privileges for all concerned. “These clamours from all sides of the divide appear to have been grossly mismanaged by government at all levels over the years,” he said. He went down memory lane on the genesis of the industrial action tracing it to the Olikoye-Kuti leadership in the Federal Ministry of Health that got the military administration of Gen. Ibrahim Babangida to approve the Medical Salary Scale (MSS), a discriminatory salary wage in favour of medical doctors in public service. “The MSS obviously disrupted the equilibrium of public sector wages as it became the basis for other sectoral players request for exclusive wages in the health sector. After the MSS was introduced, the Health Salary Scale was introduced for health workers apart from doctors,” he added. He said the Pharmaceutical Society of Nigeria demands that the enabling circular to adjust the CONHESS scale like was done with CONMESS in 2014 and 2017 be issued immediately as agreed. “In similar spirit, we request the President Muhammadu Buhari to direct the issuance of the circular that legitimises the consultancy cadre for pharmacists in public service as approved by the National Council on Establishment. “We strongly recommend that to stem the tide of industrial disharmony in the public service, the Federal Government must restructure the wage pattern to fit into one universal scale which gives preferential entry point to those who have longer duration of training to enable them enter at higher steps on the Universal Salary Scale as a permanent intervention. 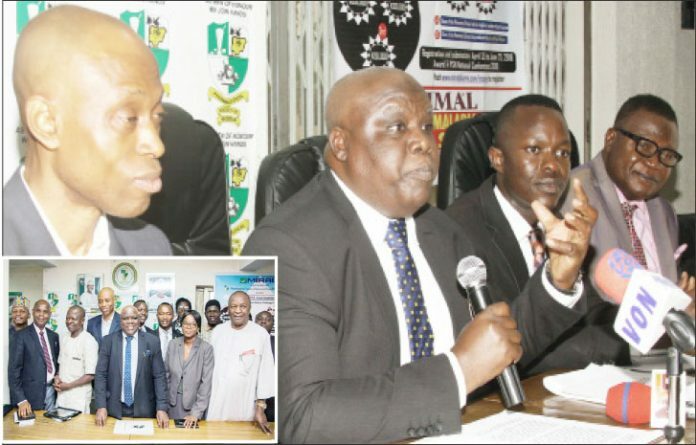 “The Pharmaceutical Society of Nigeria has always been matured and peaceful in its agitations. This has made us very vulnerable to exploitation by some stakeholders. In the current dispensation we demand justice and equity for all concerned without further delay in the interest of consumers of health in our country,” he said. Yakasai also called the attention of the government to the welfare of all health care providers, noting that the brain drain of pharmacists, nurses, doctors and all healthcare providers could be reduced with the right welfare packages. “I also use this medium to add my voice to Bill Gate call on all tiers of government to increase their budget for the health sector. A healthy country is a productive country,” he said. Yakasai also seized the opportunity to launch the Miral – World Malaria Day Essay Competition tagged, “RAVIMAL Essay Competition” observing that it seeks to engage young Pharmacists and pharmacy students in malaria elimination and tackle the widespread of malaria. Commenting, Mr Onyeka Onyeibor, Miral Pharmaceuticals Managing Director, said the competition will help take on the possible solutions on the reduction of malaria as the deadly killer of about one thousand people every day. He added that the objective of the competition is to discover students and young health professionals, who do not only know about malaria, but effectively can, communicate it to the global community as well as the Nigerian public. Should Screening Of Genes Precede Pregnancy? Can Conception Occur With Anteverted Uterus?